"Spiral Cut" - high leg, covered buttocks, sportback (open back). Asics Hydro CD is a slightly shiny and high quality competition material. Asics Hydro CD ensures a perfect fit due to the thinness of the material. The fabric is very dense and smooth, which in turn minimizes friction. Thanks to the 70% polyester fibers, the fabric absorbs hardly any water and thus guarantees maximum water fitness. The colors are resistant to light and other external influences, thus retaining their luminosity for a long time. Since the material is very thin, it becomes slightly transparent when wet (especially the lighter shades). The additionally available inlays (BH clip) can be ordered on your request. Asics Hydro CD swimsuits already have a double layer in the crotch. For the chest area there are matching inlays from the manufacturer available (not included), which make the swimsuit absolutely opaque. Please contact us in advance if you wanna place a preorder (of goods that are not in stock), then we check the availability and give an estimated delivery date. In 2017 there was an update of the logo design. The suits now only have the logo (the Asics "A") on the upper right chest - without the Asics logo. The Asics Hydro CD - a high quality racing fabric - has a fine and light gloss and becomes a bit transparent when wet (especially the lighter colors). The thin fabric is very flexible and fits perfect to the body. Besides with its densified and smooth characteristics Asics Hydro CD can perfectly minimize the friction of the athlete in water. 70% of polyester minimalizes water absorption and gives a maximum aquatic fit. High quality dye gives high color brithness and secures a longer life of colors. If you want to eliminate the transparency of the material you can purchase special inlays for the breast area. The crotch is already lined. 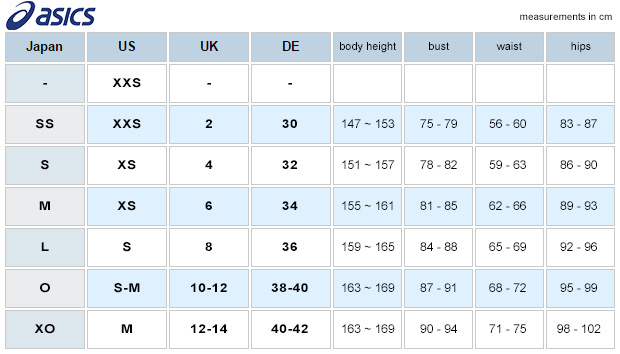 We don´t have fix wholesale conditions with ASICS yet, so we only import items on customer request. If you want to preorder a specific color and size, please get in contact with our service team. We check out the availability of your desired item and come back to you in time. After your payment we order for you in Japan. Our product prices include already all European import taxes and custom fees, there are no hidden additonal costs at delivery for all customers in the EU. I hope you understand, that we cannot guarantee the current availability of your pre-order items. We check the stock of our Japanese cooperation partners and get back to you as soon as possible.